Blog Confusing Mandarin pronunciation, part 1: The final "-ing"
Learning to distinguish and pronounce the sounds in Mandarin can be difficult, even more so if you rely too much on transcription system or don’t learn them properly. In some cases, there are also variations among native speakers that confuse second language learners. In this article I will first share my thoughts on variations in pronunciation and then discuss an example, the Pinyin final “-ing”. These observations are gleaned from teaching experience as well as error reports here on Skritter. I call this “part 1” because I intend to write more about this later! If you have a specific sound you find confusing, please leave a comment and I will consider talking about that sound in future posts. Before we start talking about specific sounds, let’s talk about mental categories. Our brains sort language sounds into different categories formed by earlier exposure to languages, both native and otherwise. If our categories aren’t aligned with those of native speakers’, we will make mistakes. Similarly, if we’re not aware of natural variations in the language, we might mistakenly separate two sounds that for a native speaker are actually the same. Thus, we can either fail to separate two sounds that ought to be distinct or fail to merge two sounds that to us are distinct, but mean the same thing for native speakers. In this article, I’m going to give two examples of the latter case: the final “-ing”. When I teach pronunciation, I always stress the importance of thinking in terms of initials and finals rather than looking at the Pinyin spelling, which is full of traps and pitfalls most learners aren’t aware of. The most common mistake is to think that by adding a letter in Pinyin, you just change that particular sound. For instance, the “-in” in “pin” is not the same sound as the “-in-” in “ping”! Thus, “-in” and “-ing” should be treated as two different sounds, not as the same sound with an added “g”. I’m going to use the International Phonetic Alphabet (IPA) here, but don’t worry if you’re not familiar with it, I will explain. There are slight variations for how “-in” and “-ing” are transcribed by different scholars, but these are from Duanmu (2007) The Phonology of Standard Chinese. “-in” is simply written as [in], which should be self-explanatory. It’s a normal “i” as in Pinyin “pi” and a normal “n”. No surprises here. You can listen to the recording we have here on Skritter by looking at a character such as 贫 in the scratchpad. “-ing” is written as [iəŋ], which requires some explanation. The first sound, [i] is the same as above (one sound, one symbol). The second sound [ə] is the central vowel also found in English “the”. The third sound [ŋ] is a merge of “n” and “g”, a back nasal similar but not identical to “ng” in English (it’s farther back). Check for instance the recording for 平 via the scratchpad. If you listen to the two recordings one after the other, can you hear that the difference between them extends beyond just “n” and “ng”? 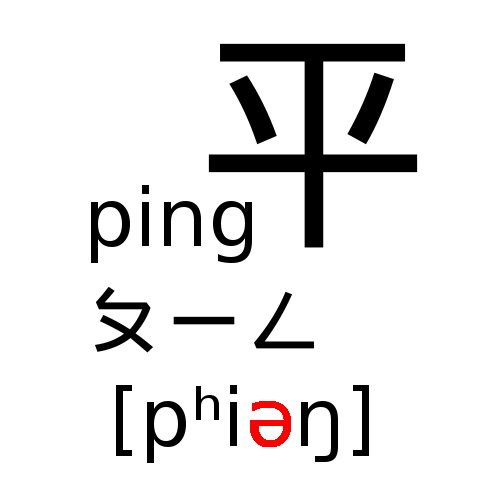 The first sound, “pin” doesn’t have the [ə], but the second sound “ping” does. The problem is that since “in” and “ing” are spelt almost the same way, many students assume that the sounds must be similar as well, but this isn’t really the case. If we take the two example syllables “pin” and “ping”, the first is pronounced as most students would expect, but the second is not. If I had to write that sound closer to how it is pronounced, I would write “-ieng”, so “ping” would be spelt “pieng”. This is not a valid Pinyin syllable, so never write this, I just show you how it’s actually pronounced. As I mentioned in the introduction, there are local variations. I haven’t done enough research into this particular final so I can’t tell you for sure where it’s pronounced in what way, but there seems to be a difference between southern and northern China, or at least Beijing and Taiwan standard. 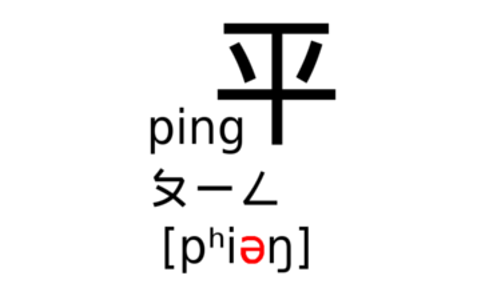 In Taiwan, it’s not uncommon to actually pronounce “pin” and “ping” almost the same way, some people even merge these finals completely so they are pronounced exactly the same way. This typically does not happen in northern China, where the central [ə] is clearly audible. This means that the difference between “pin” and “ping” isn’t just about “n” or “ng”, but about the vowel sound(s) as well. This can lead to the error I brought up earlier, of thinking that the same sound (phoneme) is actually two different ones, whereas that wouldn’t be the case for native speakers. For instance, a student might mishear “ying” for “yong” or simply failing to understand that a sound that contains an obvious [ə] can still be “-ing”. Hopefully, you won’t make those mistaken in the future! The way towards understanding sounds in foreign languages is mostly about listening very closely and paying attention to detail, mixed up with a small amount of theory, such as reading articles like this. Listen to the “-in” and “-ing” around you and see if knowing about the difference makes it easier to understand and/or pronounce them!